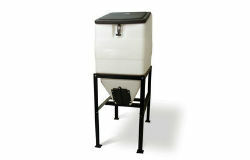 Conveniently stores 270 lbs of feed products while eliminating feed contamination and rodent infestation. Also excellent for storing Wood Pellets. The hinged lid lifts up allowing feed product to be poured in and the slide hatch at the bottom slides opens to drain feed products. This design means your feeder is autorotating your feed for you and ensuring it doesn't expire. The slide hatch has a wingnut lock that when engaged won't allow the hatch to slide up or down. A five gallon bucket easily slides underneath the drain hatch. Transparent sides make checking product level easy. Weather resistant lid design includes a rubber gasket to keep feed dry in most conditions.